the quoted before refferes to the settings i used before i used the other colour..
and please no : use buildtak or use hairspray or glue ! The heatbed is winded up in the middle and on the outer sides lower down so it squishes the filament on the middle while it does not touch the plate on the sides ! Wow.... that's quite an off failure! i had this problem before with the bed adhesion not being too good. with the bed levelling, the trick i used was to actually go a bit less than an a4 papers thickness. when my initial layer goes down, it's actually looking like the 'too low' in this picture ( https://storage.googleapis.com/helpdocs-assets/Sd0njU6Ihj/articles/ZhBlGFD9Ah/1533649192933/first-layer.png ). the extruder 'squishes' the filament into the tape. the other thing that might be going wrong is your bed temperature curve is not well calibrated and you're actually getting overshoot. (e.g. it's supposed to be 50C, but it goes to 60C, then 40C, then 60C). try the painters tape, if it doesn't work then try this calibration. It looks very much like your nozzle is closer to the bed than you think it is. How are you measuring the nozzle distance? Your pictures look exactly like what happened when I inherited a roll of off-brand blue painter's tape. Nothing would stick, even after wiping with alcohol. I then bought a roll of 3M painter's tape and then had no problems. I find that PLA sticks to 3M tape even without the bed heated. maybe during that week of not use your filament soaked some moisture from the air? try even hotter than 210 for the first layer without fan at all, then lower and put the fan on from the second layer. Also while leveling, do not push it too hard down leave the nozzle low enough to not print in air and have the lines just about touch each other without having a gap. One thing I was doing before when it curls is to press the nozzle even more hopping it will stick which actually has the opposite effect. nope this pla is best at excatly 68°C tested in my lab at my university ! tianse filament uses a blend wich is best on 68°C tested on black , blue , red, green , flourescent yellow, white and coffee brown ! The only suggestion I can think of is to raise the nozzle very slightly. It looks to me like the first layer might be over-extruding enough that each new line is lifting the previous. Are you using new tape? Did you get a new roll of tape recently? Makes me think the tape might be contaminated with something, maybe try cleaning it with Windex of Isopropyl alcohol? Personally, I've never had any luck with a clean substrate and always use a coating of PVA glue. What is the height of the first layer? Standard hotend - 0.4mm? 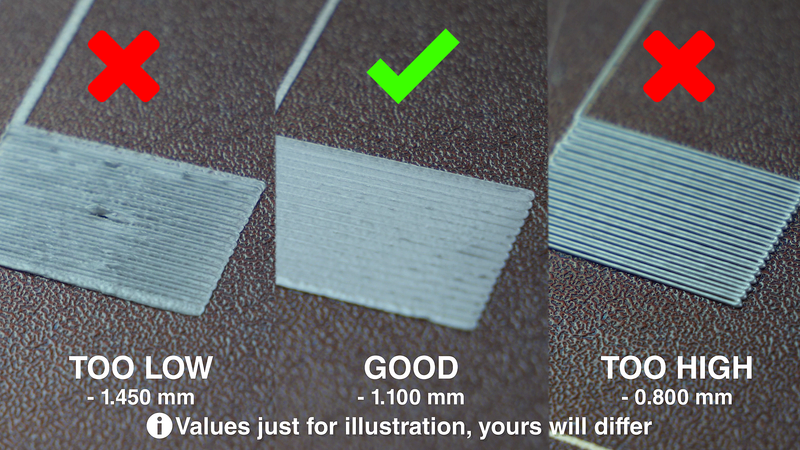 the correct first layer at 0.4mm (hotend) is 0.32mm, the next can be any. what do you mean by that ? so on the first layer i should use 0,32mm and on the others 0,2 (or whatever me pleases ) ? ok i will try it and then report back. is it ok if i dm you ? "Makes me think the tape might be contaminated with something, maybe try cleaning it with Windex of Isopropyl alcohol?" That's what I would assume, too. The tape looks very shiny. The painting tape is not suitable for this. The tape is covered with paraffin so that the paint does not go over! I use clean glass, I do not grease anything, I do not spray. Zero problem. I use mirror without exactly size what's table id and stick to table by some silicone. After table leveling problem was solved. You may also try to lower nozzle temperature.